On the grounds of the Washington Monument, Constitution Avenue & 17th Streets, NW Washington, DC. 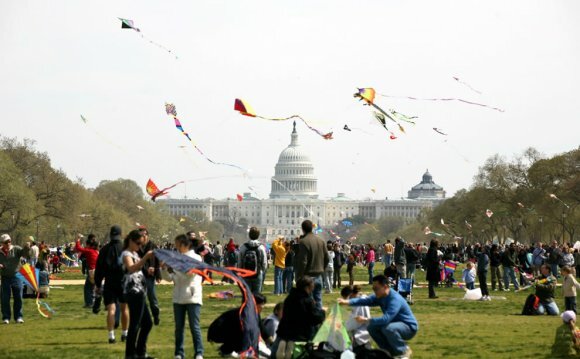 On the Competition & Demonstration Field (free registration required), experienced kite makers enter kites with the theme of “Spring Around the World, ” showcasing cultural heritage, international kite traditions and international friendship. 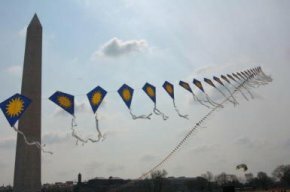 The popular Rokkaku Battle and Hot Tricks Showdown are displays of kite flying showmanship. The Rokkaku Battle features hexagonal-shaped fighter kites commonly flown in Japan and now in many other parts of the world. In the Battle, teams of kite fliers compete to “cut” or “ground” opposing kites. The Hot Tricks Showdown is a competition in which multi-line kite fliers engage in a series of one-on-one competitions and maneuver their sport kites in amazing flight patterns during 30 seconds of music. The winners are selected by audience applause. Youth competitions take place on the Family Field. Families can also get expert advice and practice new skills. In the Kite Club Display Area, master kite fliers and kite makers showcase their prized kites. This area is limited to invited individuals and clubs. Throughout the Activity Tents, children can make a kite, decorate a bookmark and a wind sock, receive lessons from experienced fliers and visit the Kite Doctor to repair a damaged or broken kite.